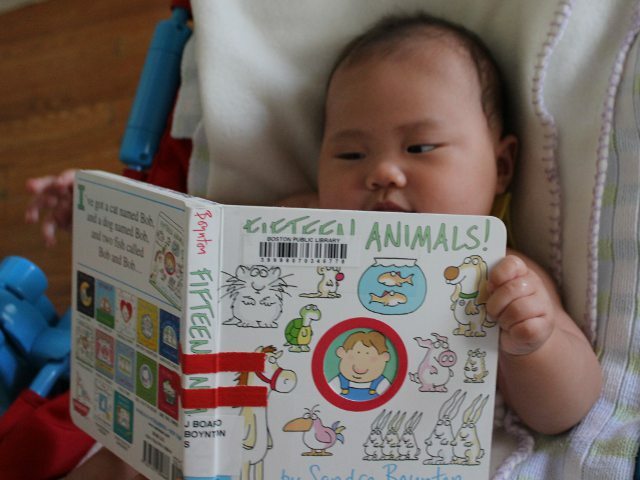 My baby liked looking at piggies in a previous book by the same author so I thought she might like seeing all the different animals in Fifteen Animals! by Sandra Boynton. The front cover shows 15 cute animals against a white background. The center of the cover is cut out to display a silly-looking farmer underneath. The cut out is surrounded by a red circle adding immediate visual appeal for young babies. Arya kept grabbing at the circle to feel the texture of the cut out cover. Fifteen Animals! is narrated from the perspective of the farmer in blue overalls. The farmer explains that he has 15 animals and that he has given each one a special name. On each page is a picture of a different group of animals and text regarding their special name. The book is designed to teach little children how to count as a sequential number shows up next to each additional animal. The numbers are all drawn in different colors and contrast with the background of each page. Kids who are old enough to identify animals should be able to name the animal before reading the text. Drawings are cute and whimsical, but still real enough to look like the respective animal. Arya especially liked the cat and dog because they were big and had huge eyes staring straight out of the book. Even the youngest children will quickly grasp the theme in the names of the animals. Even adult readers will smile at the twist in the name of the last animal. Fifteen Animals! is ideal for toddlers just old enough to learn how to count. With the cute pictures and funny text it also appeals to young babies and literate children. Sandra Boynton has written and illustrated more than 40 books. Her website also lists her music albums and samples of the thousands of greeting cards she has designed. Fifteen Animals! costs (including shipping) $6.95 new and $5.99 used from Amazon.